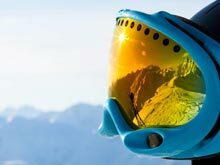 Are There Shortcuts To Good Skiing? How is that for a question? And one I'm sure all skiers want to hear the answer to. 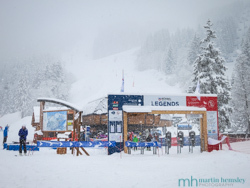 But before I go down the road (or piste) to answering this question, this blog post will be different to all the others I've written this winter. I've only just realised that the vast majority of these posts have been about snow conditions, or me getting carried away with the scenery and photography. After all these are by-products of this amazing sport, and in particular me carrying around my mate called Canon. Apologies if you are new to this blog page, but I'm known for taking a few photos. 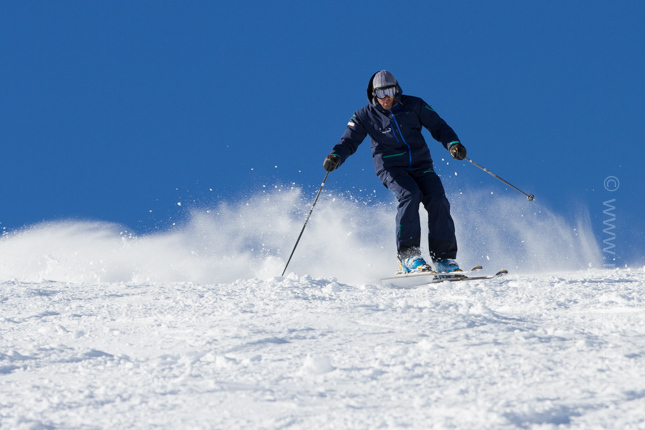 Right, back to today's post that this time is about ski technique, being a ski instructor after all! 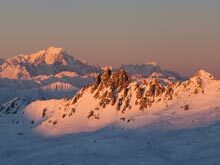 When first meeting clients, I will ask them about their skiing and in what areas they think they would like to improve. They will give a description of what works well for them, and then explain where their performance breaks down. At this stage it is really important for me to listen carefully to their explanation, and then compare this to my first observation of their skiing. Sure, there could be one of a number of things that affect their skiing performance. This is a subject I've written about before, click here for the link. More often than not, an area of 'technical' improvement will be balance. "Hah, that old chestnut" I hear you cry. 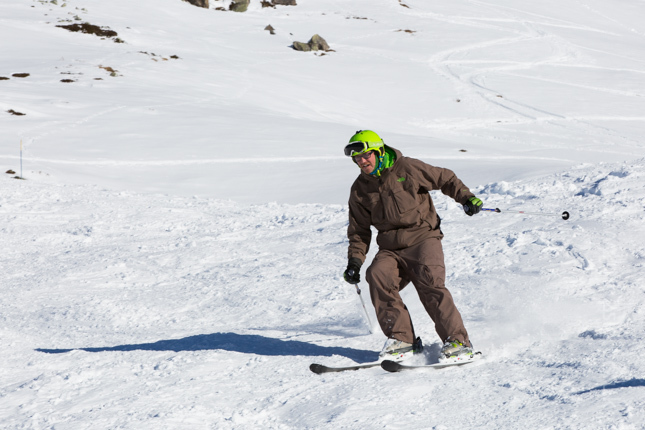 But you see, balance is absolutely critical in order to achieve enjoyable, relaxed, pain free and skillful skiing. "Yes, we all know that Martin" again I hear you cry. So then why sometimes don't we accomplish this? Our brain is an incredibly powerful force. For example, just watch a toddler figure out how to learn to stand up for the first time, and then teach themselves to walk. It's fascinating as an observer to watch this process, and very inspiring to notice the pace at which said toddlers achieve their goals. Sure, there are tumbles, along with tears. However the child's determination and encouragement along the way by proud parents help things greatly. Does this happen with skiing? Sadly not. A toddler can somehow learn how to stand, and walk, all by themselves. 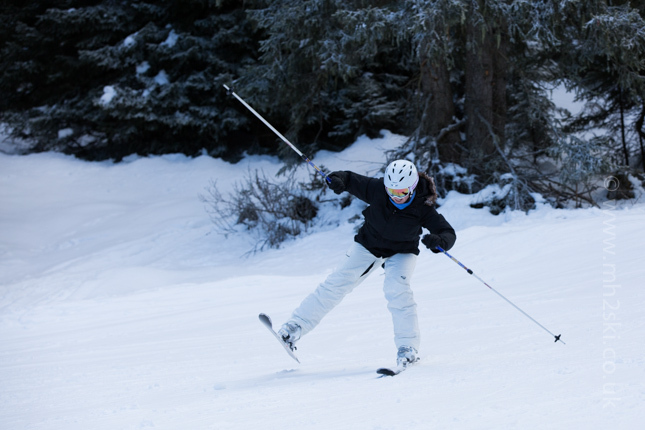 Skiers will try desperately hard to do the same, but will regrettably fail to achieve good and effective balance. I hope that doesn't sound negative. However there are a few reasons for stating this. Unfortunately our brain tells us to do the wrong things on skis, remember! For some reason it is hard wired to get us to do the complete opposite to what we need. I'm not sure why, but it is very rare to come across someone who has incredible proprioception that enables them to make automatic adjustments to improve their balance on skis. "Slow down there Martin, this is getting heavy now". Yep, sorry about that. Let me try to explain further. There are three planes of movement that can affect balance; fore and aft, lateral and rotation. Without getting too in depth with these, the good news is that to trained eyes, the areas of improvements (and strengths of course) can be spotted quite easily. Speaking of strengths, I believe these are really important to mention to people. It is often to easy to get bogged down by our weaknesses, due to our determination to improve, just like the toddler's determination to learn how to stand and walk. Fore and aft positioning, lateral stance and rotation can all affect our balance, either as individual elements, or all together. This is why when Michael and I teach complete beginners, we really focus on how skiers stand effectively over their skis. There will be constant tweaks and reminders on how to balance. This is true for green piste skiers, and blue piste skiers, red piste skiers.......... you get my drift. Don't forget our brain tries tell us to do the wrong things on skis. Some of this is down to our knowledge, perhaps even our fears on skis, or potentially peer pressure from internal and external factors. But the good news is that with continual focus, and external observation with feedback, our balance can and does improve. Let me now explain this, and at the same time, introduce you to Olivia. It would be easy to jump to conclusions and say that her balance here is absolutely shocking. Granted it doesn't look pretty. Does Olivia fall over? No is the answer, so let's have a look at her balance just a fraction of a second later in the same turn. Not so bad at all is it? A great recovery in fact. 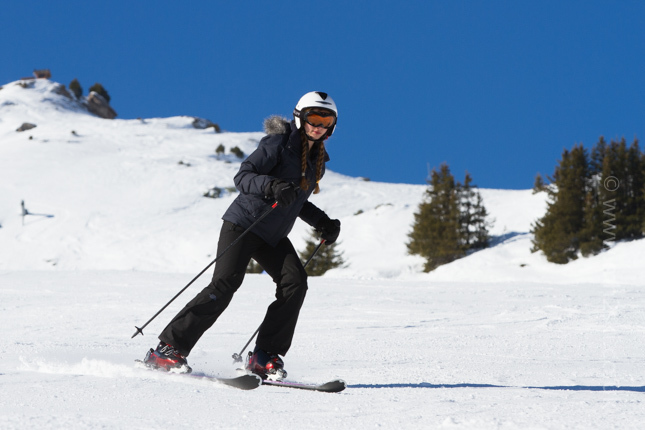 The next thing to mention is that these photos were taken of Olivia when she was skiing off-piste, to the side of the steep Bartavelle black piste here in Meribel last week. In other words, challenging terrain. I've had the pleasure of skiing with Olivia for about nine winters, and she has had a huge amount of race training by race coaches and other instructors. Olivia has represented her school twice at the English School Ski Racing Championships. 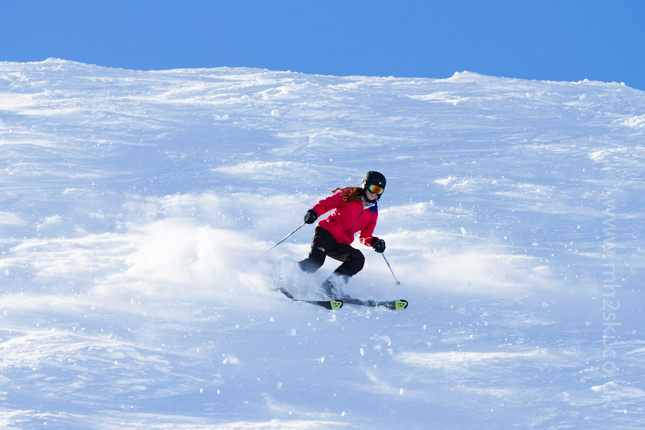 A fantastic skiing C.V. don't you agree? 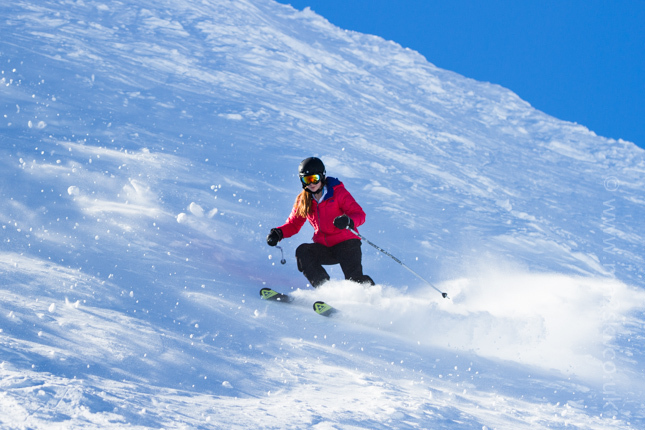 All of this skiing, along with constant observation and feedback from her trainers, has enabled Olivia to fine tune balance and given her the skills to make adjustments very quickly when needed. 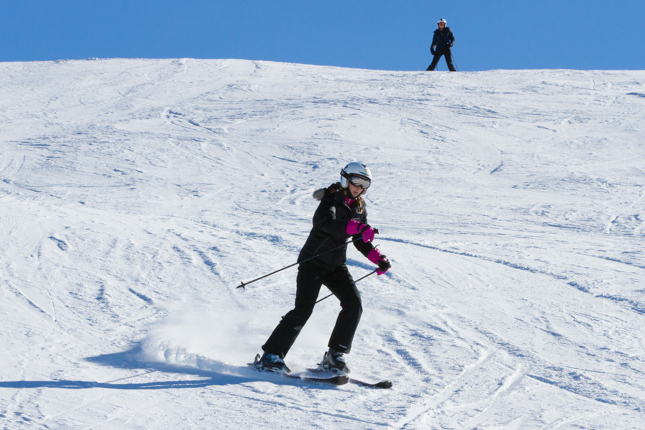 Here is a photo of Olivia skiing about four turns after her 'wobble'. Olivia looks great, doesn't she? And this is mainly down to (but not only) lovely, stable balance. This is the key. We all lose balance. Beginners lose balance, intermediates lose balance. With practise and feedback, our balance improves and our recoveries are fewer and smaller. Even ski instructors lose balance, I did quite a few times today, but not many people would've noticed, but I felt it all the same. Everybody has wobbles, it is virtually impossible to be in complete and utter balance. Skiing is a very fluid sport after all. I remember free skiing with my mate and fellow ski instructor, Slippers Jackson, back in November over in Tignes. We were enjoying skiing together, plus he was keen for me to grab some action photos at the same time for his website. I remember this particular pitch that Slippers skied when I captured this photo. It was taken on the Tignes glacier, just to the side of a black piste called 'Leisse', ie a steep pitch, even though the photo makes it look as though it was a flat gradient. Slippers looks completely balanced. I remember saying to him when he stopped that his skiing looked great. He mentioned that he had a couple of turns where he was off centre, ie not quite completely balanced! 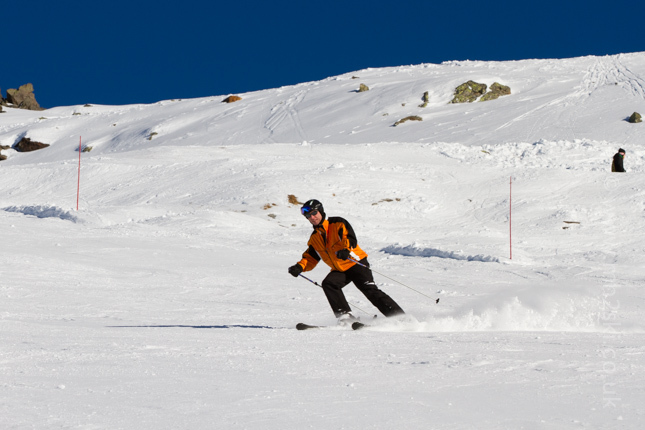 Going back to this blog post title - Are There Shortcuts To Good Skiing? The answer is - You betcha. If you are able to gain professional knowledge on what good balance is (fore and aft, lateral and rotational). Then receive regular observation from a trained eye and have honest feedback, there is no reason whatsoever for not improving your skiing performance faster than those who 'think' they ski well. 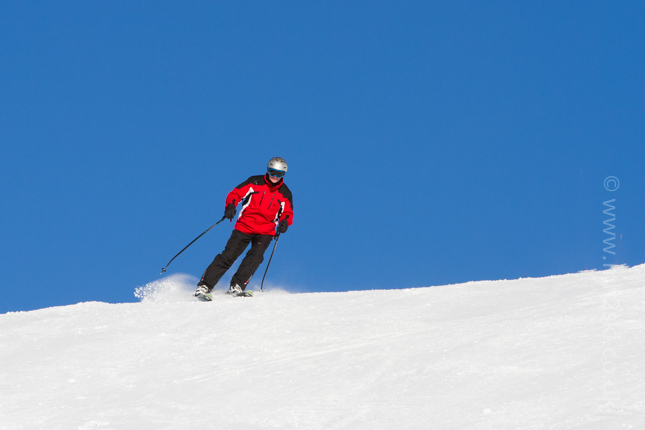 Don't forget, unfortunately, our brain tells us to do the wrong things on skis. It helps if we are able re-wire, or re-educate if you like, our brain. I really hope this blog post hasn't been too heavy, or too technical. Reading an article can sometimes be more intense than say having a conversation in person. 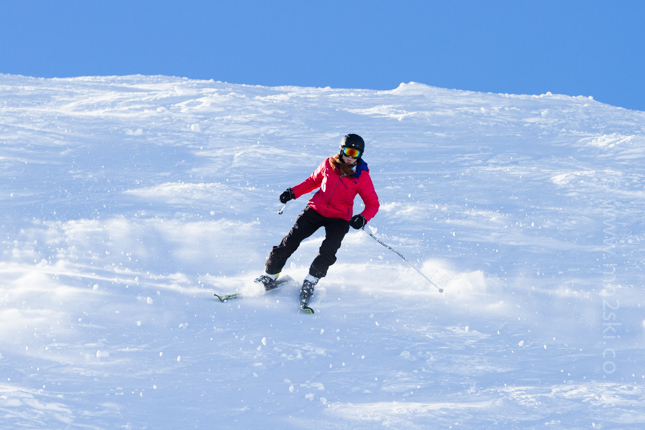 If this post is right up your street, you might like another I wrote about skiing technique, click here for the link. My next post will more than likely be about snow conditions, mountain views, and the odd photograph of something skiing related. Feel free to share away on Facebook, Twitter and Google+ by using the social media icons. Or leave a comment below. By the way, all of these photos were taken this winter. By the way, the latest snow conditions are fab. Martin.